EFF‘s Privacy Badger blocks spying ads and invisible trackers. Privacy Badger is a browser add-on that stops advertisers and other third-party trackers from secretly tracking where you go and what pages you look at on the web. 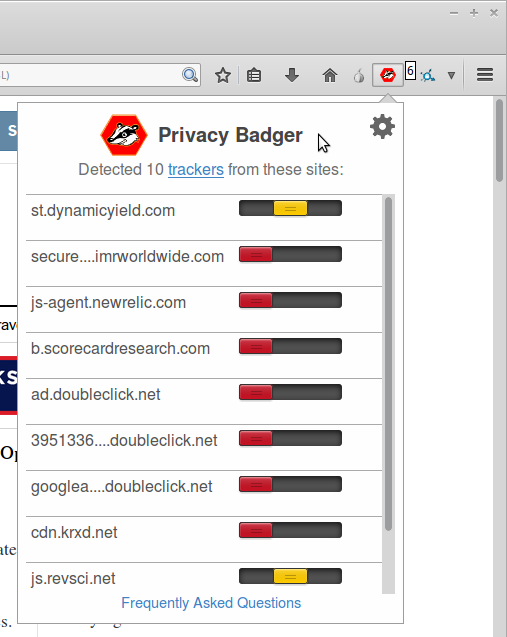 If an advertiser seems to be tracking you across multiple websites without your permission, Privacy Badger automatically blocks that advertiser from loading any more content in your browser. To the advertiser, it’s like you suddenly disappeared. Purism installs EFF’s Privacy Badger so you are protected from spying ads and trackers by default! How does Privacy Badger work? When you view a webpage, that page will often be made up of content from many different sources. (For example, a news webpage might load the actual article from the news company, ads from an ad company, and the comments section from a different company that’s been contracted out to provide that service.) Privacy Badger keeps track of all of this. If as you browse the web, the same source seems to be tracking your browser across different websites, then Privacy Badger springs into action, telling your browser not to load any more content from that source. And when your browser stops loading content from a source, that source can no longer track you. Voila! At a more technical level, Privacy Badger keeps note of the “third party” domains that embed images, scripts and advertising in the pages you visit. If a third party server appears to be tracking you without permission, by using uniquely identifying cookies to collect a record of the pages you visit across multiple sites, Privacy Badger will automatically disallow content from that third party tracker. In some cases a third-party domain provides some important aspect of a page’s functionality, such as embedded maps, images, or fonts. In those cases Privacy Badger will allow connections to the third party but will screen out its tracking cookies.